Home Products, Packaging and Promotion! Need some help marketing your talent? Dave DeAndrea invites you to consider your voice work as a product. Similar to how a grocery store is stocked with food items, you could be stocking your shelves with voice over products such as commercials, telephone messaging and more. Once you’ve figured out what your products are, Dave will help you to package it and also give you tips for best positioning your voice both online and offline. Welcome to Voice Over Experts brought to you by Voices.com, the number one voice over marketplace. 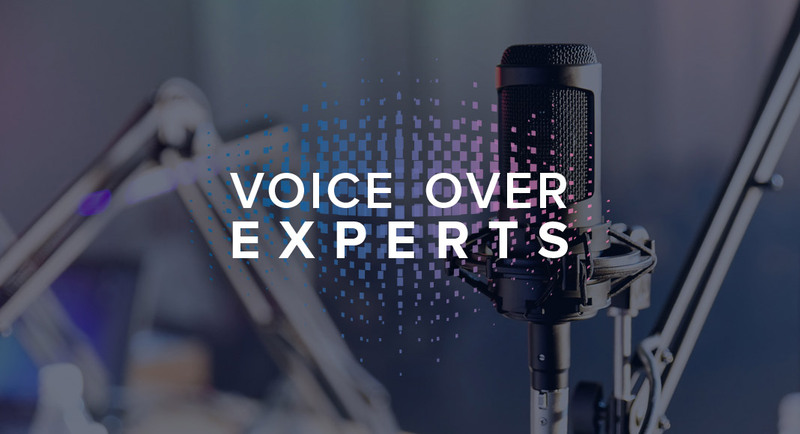 Voice Over Experts brings you tips, pearls of wisdom and techniques from top instructors, authors, and performers in the field of voice over. Join us each week to discover tricks of the trade that will help you to develop your craft and prosper as a career voice over talent. It’s never been easier to learn, perform, and succeed from the privacy of your own home and at your own pace. This is truly an education you won’t find anywhere else. Hi there! This is Dave DeAndrea voice actor and producer and I’m really glad to be back with you here again on Voice Over Experts. It can be extremely beneficial to look outside the VO industry to glean some ideas. A while back, I’ve met a few friends who don’t know anything about voice overs, but have years of marketing and sales experience. Now, this turn into a really V8 moment for me, you know. Why didn’t I think of that before or I could have been doing this all along. Now, I’ll spare you the hours of details and just boil us down into a few key points. It’s not a step by step instruction. Just to get you thinking about how you can apply this in your own work. You know, honestly, everyone is different, different strength and specialties. So, a step by step plan just wouldn’t work for everybody. Ready? I want to keep this to three key points – Product, packaging and placement, okay. First, product, I know that we as voice actors talk for a living, but I want you to think of your voice work as a product that you’re selling like food, okay. Now, for many of us it may actually be more than one product. It may be several. There may be aspects about your voice work that may be different. For example, I do commercials, imaging, video games, trailers, jingles, presentations, IVR, animation, productions – all different products. I like the variety. So, if Dave DeAndrea is the name of my store, all the different things that I just listed would be different products on the shelves. Now, it’s like a supermarket. Now, for others they may specialize in one thing. They may be able to do a variety of voices, but they’re primarily a specialty store. Nothing wrong with that, In fact, some of the known voice actors fall in this category. When you think Don La Fontaine, what do you think of? Movie trailers, his specialty, his product. Mel Blanc, cartoon voices. Joe Cipriano, TV promos. Get the idea? Now, the first thing you need to do is figure out what your product or products are. If you’ve been at this for a while, take a look at the past year or six months. Make a list of categories like commercials, presentations, animations or whatever types of gig you’ve been doing and then look back over your statements and see which ones have been your real moneymakers. Now, the biggest bucks may not be coming from your favorite jobs. You may really want to do cartoons, but you’re getting hired for a lot of medical presentations. You may want to do Monster truck rally spots, but you’re doing lots of on hold messages. These will help you figure out what products are working for you and which ones need a little work. Once you’ve figured out your product or products, it’s time for packaging most specifically branding and demos. For branding, lay your websites, your business cards, your letterhead, your avatars on your social networking sites all be tied together and all be a good reflection of what your selling. Even your head shot if you have one should reflect the attitude of your product. Are you an edgy movie trailer guy? You pick fonts, colors, and a logo or design that says I’m an edgy movie trailer guy. If you do more of kid oriented stuff, make it light and fun. If you’re classy, go classy. If you’re corporate, go corporate. But, when you do, listen to me on this – When you do, take the time and spend the money to make sure it’s great. Now, I can’t tell you how many times someone is handing me a business card and apologize for it. “Ah, I’m working on a new one and this is just to like…” Don’t do that. Don’t put your product out there until it’s ready and if it’s time for update then update it. Demos, again, don’t do this until you’re ready. But when you are ready, have the demos made for each of your products. You know, at least for your top one to three products. Take the time, spend the money and have it done right. It doesn’t have to cost a fortune. In fact, warning shameless promotion ahead. One of my products is producing demos and coaching people at ridiculously affordable prices. Visit killervoicedemos.com, I’d love to help you out. Now, each of these things branding and demos could be and most likely have been podcasts topics in of themselves. Maybe we’ll zero in on those more in the future. This is just an overview. So, let’s move on to the third and final point. You know your products. It’s packaged right now. Product placement – Everything you’ve done up till now will have been a waste of time and money if no one ever sees it or hears it, right? What are you going to do to get your product seen and heard? How are going to stand out and be noticed among the thousands of voice actors? My brother-in-law works in sales for a wine distributor and he goes to the stores, talks to the managers, gets the wine in the stores so people will buy it and fights to get the best placement of his product. I’m sure it’s true for anyone selling products on a store. You want your products at eye level where people can find them easily. It boosts sales. You want your products in a special display if possible. It boosts sales. You want your products on an end cap. In fact, I just read on something about Fredo Lay, you know, potato chip and snack guys. That said that if given a choice between six feet of shelf space versus one end cap. They will always choose the end cap because it produces a 30% to 40% sales increase just by its position. So, you don’t necessarily have to be everywhere, but you do need to be in strategic places that can be of the best benefit to you. So, how do you plan doing voice over. You got to have to work at it. Be tenacious. Ask questions. Ask your agent. What can I do to be featured more prominently on the site or in emails that you’ve sent out? If you’re on a casting site like Voices.com, ask them what steps you need to take to be at the top of the favorites list and get noticed. Target businesses and studios related to your products and talk to them. Attend conventions. Get out there! Get noticed in a positive way. So, again, know your product or products, package them well, place them well. You could do this! You can! Focus! I am totally rooting for you, okay. And hey, I’d love to hear how you’re applying these things and how they’re working for you. Email me via my website at DaveDeAndrea.com. That’s D-A-V-E-D-E-A-N-D-R-E-A dot com. or killervoicedemos.com. God bless! Female: Thank you for joining us. To learn more about the special guest featured in this Voices.com podcast, visit the Voice Over Experts show notes at podcasts.voices.com/voiceoverexperts. Remember to stay subscribed. If you’re a first-time listener, you can subscribe for free to this podcast in the Apple iTune’s podcast directory or by visiting podcasts.voices.com. To start your voice over career online, go to Voices.com and register for a voice talent membership today. Dave DeAndrea, winner of the 2009 Voicey Award for Best Male Voice, is a multi-faceted Voice Actor and Producer who’s credits range from commercials, presentations and animation to jingles, imaging and trailers. He’s also the driving force behind killervoicedemos.com, a great resource for voice actors to have professional demos made at an affordable price. Dave lives on the beautiful southern Oregon coast with his wife, Kristen, and their 4 children, the youngest of which was recently adopted from Ethiopia. I’m currently learning about Target businesses and working in the voice over industry.